Infused waters are an ideal drink to serve at dinner parties or any kind of event. 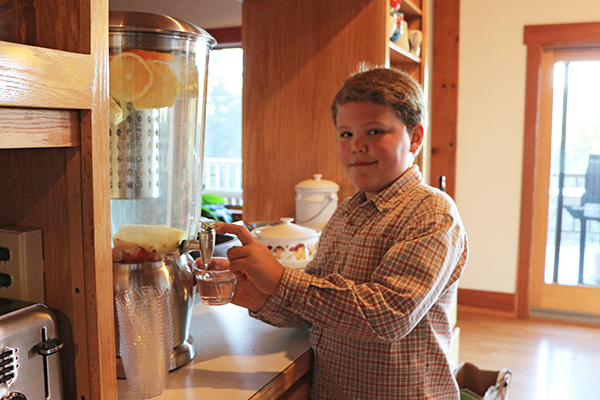 When you have a large dispenser filled with colorful fruits, you’ll find that it attracts children, health enthusiasts, guests abstaining from alcohol, and curious foodies. Plus, the flavor of the infused water often complements your dinner dishes as well. Grapes and pineapple, as well as strawberries, are great in large batches of infused waters because of their crowd-pleasing sweetness. 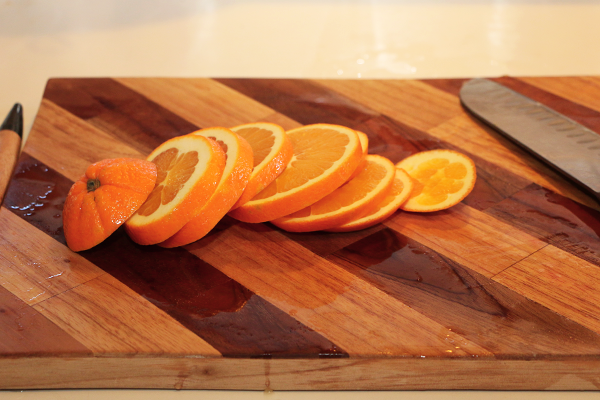 A single orange is an economical choice that provides a lot of flavor. 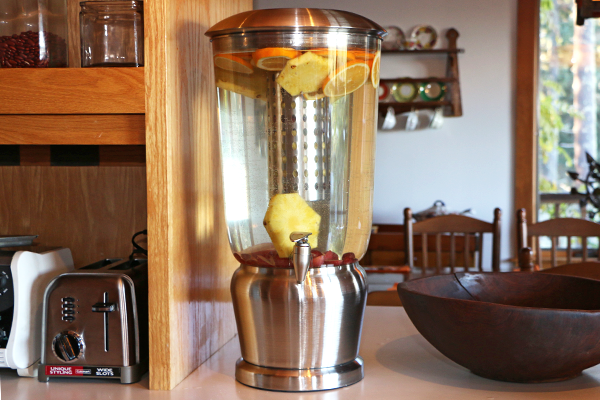 Tips: because these large dispensers hold so much water, you need to adjust the amount of fruit you use as go. 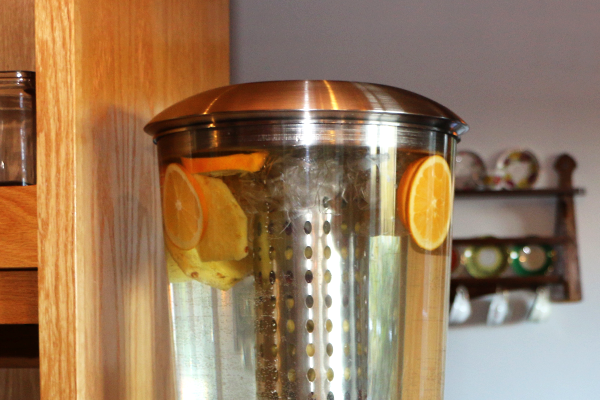 Start infusing at room temperate in the morning of your event or at least four hours in advance. More details below. First, clean your dispenser. 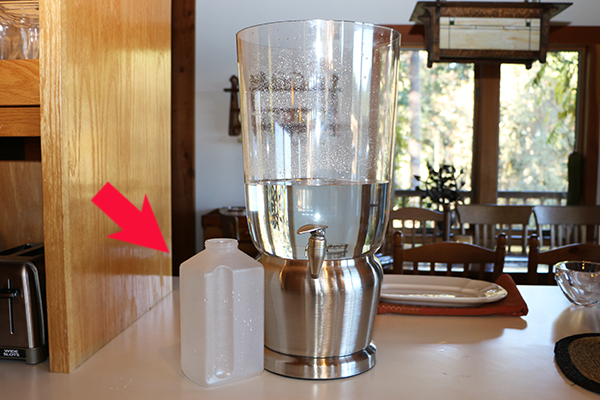 This is an important step to remove any lingering flavors from the last batch of infused water. 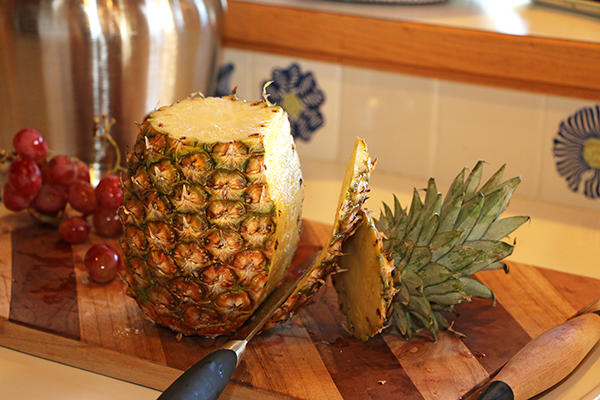 Take a sharp knife and remove the skin of the pineapple. Be sure to follow the shape of the pineapple to minimize waste. 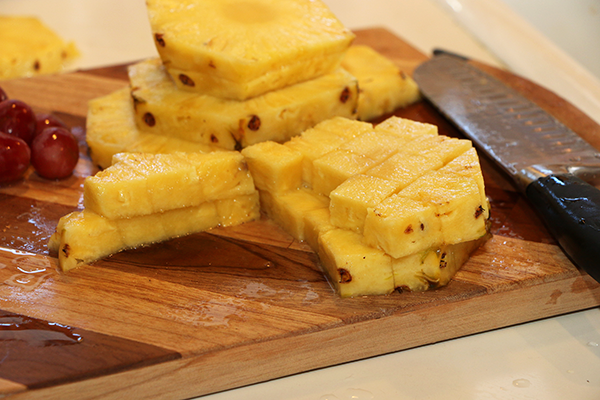 Cut the pineapple into 1″ slices. Then dice at least half of those slices into cubes. 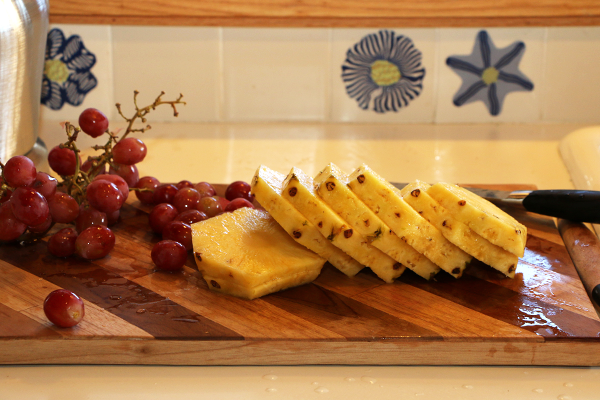 It’s important to leave some slices as whole rounds because an entire pineapple + grapes will not fit into the infused water core. Next, take your grapes and cut them into half. This allows the grape juice to seep out and infuse. 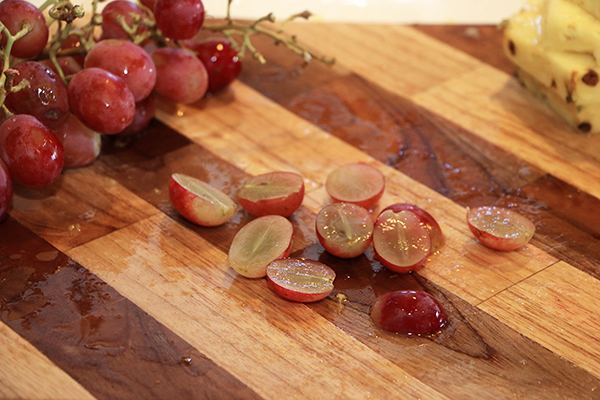 Never try to infuse whole grapes as the skin is not very permeable. Layer the grapes halves and pineapple cubes in your dispenser’s core. Push the fruit down and fill to the very top. The pictured dispenser is made by TableCraft, who also produces some gorgeous dispensers, and features a large infusion core. 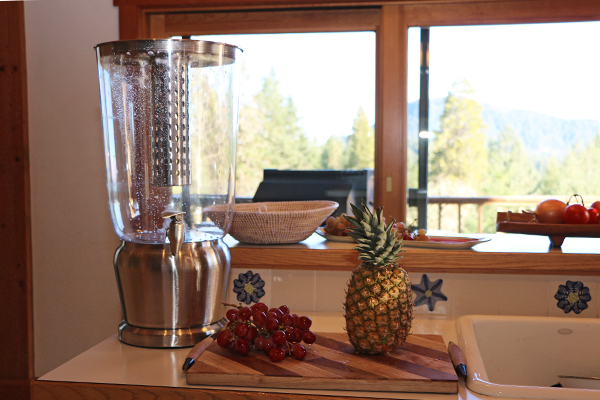 You will need a pitcher or pullout kitchen faucet to fill the dispenser. Leave about 20% unfilled because you are going to add ice later. Slice an orange and discard the end pieces. 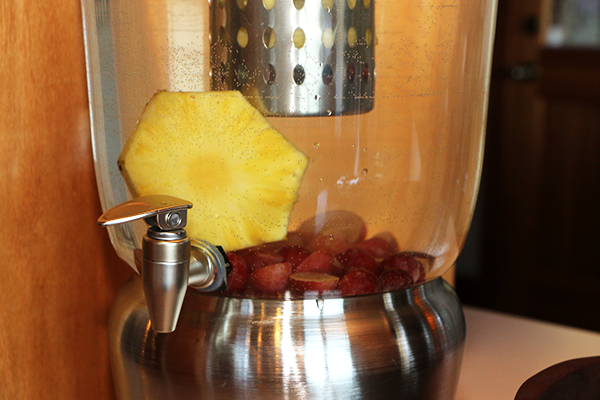 Add the orange slices, grape halves, and pineapple slices to the dispenser, then add the infusion core. You will notice that most fruit floats to the top, which is a good thing. Do not block the spigot. 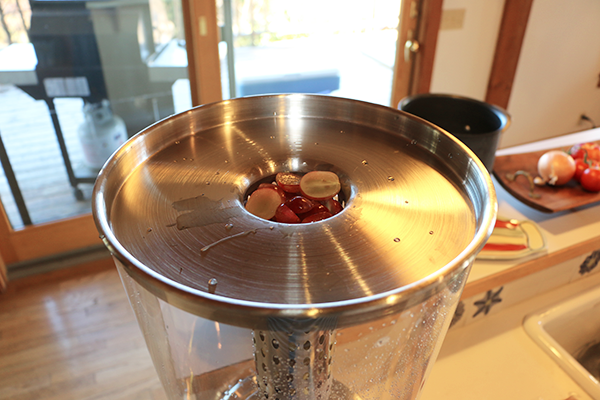 Filling the bottom of the dispenser with too much fruit will result in your water getting clogged. Let the fruits infuse for 4-8 hour at room temperature. Right before serving, fill the top the water with as much ice as you have on hand. Give the water a good swirl with a large spoon. If you taste the water before your event and it is not flavorful enough, add 4-5 tablespoons of sugar. Using sugar is “cheating” in a sense, but it’s important that your finished product tastes great and does not go to waste. 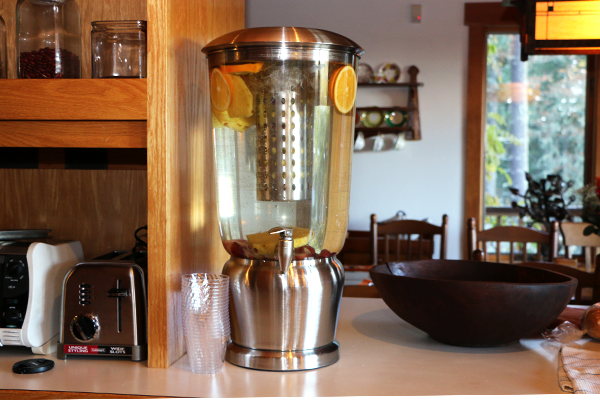 Wondering where you bought your glass, stainless steel beverage container? I love it! I too would like to know where you purchased the large glass, stainless steel beverage container. It is made by Tablecraft, that does not tell the reader anything about where it was purchased thus it does not answer the question. I just bought a water dispenser and I will be sure to try your recipe. Thanks for the tip about cutting the grapes in half, I wasn’t doing that before. How many days does the infused waters taste good? For example, If I did it on Monday, it tastes good until…? Bed Bath and Beyond sells a 3 gallon dispenser like this one, online. Don’t know if it is in stores, but be sure to use their 20% off coupon since the dispenser retails for $69.99. We are looking for a “Fruit Infused dispenser” Could you suggest me to buy for Our office space in India. If using blueberries, do you cut them in half? All sounded good until you added the sugar! Thank you for sharing the above information, it’s really helpful for me to do daily exercise and a proper diet. My name is Mr Aaron Bills. 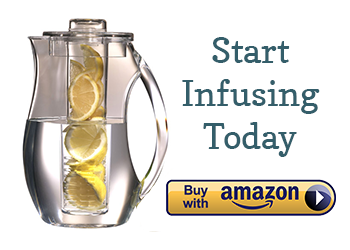 I will like to purchase Infused Water Dispenser? What are the prices including tax? Does that affect the pricing?